A modern Memento mori from German painter Dirk Jakobs: Bones, muscles, flesh, meters of veins and arteries, banal, but crucial part of the human body: Our legs allow us to cope with the daily struggle of life. Mobility is essential. Not in Olympic terms, because very few of us are consciously chasing records on a red cinder track and hunting for the finish line. But the pressure of time is all around in our everyday life. In the morning, when the alarm clock rings, we need to be careful, not to get up on the wrong side of the bed. The day would be hell. Our legs carry us in the bathroom, then in the kitchen, where the morning coffee ensures, that they will carry us further through the day. In his painting ‘Time Explosion’, Dirk Jakobs refers to the pressure of time, the high blood pressure both of the body and the society. The run of the individual is transferred to a metaphorical comment on the required speed in the civilisation at the beginning of the 21st century. 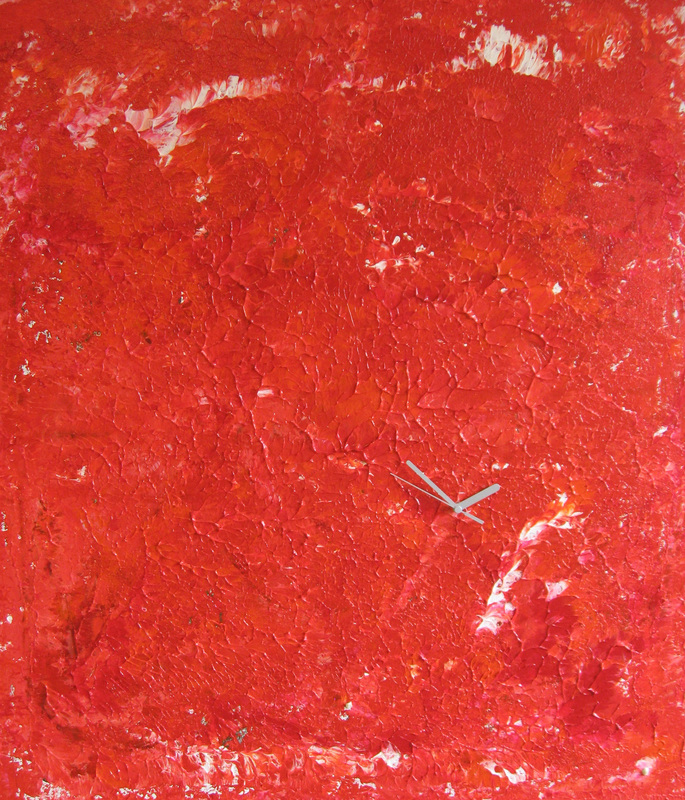 For this painting, part of the series ‘Imago 2007’, Dirk Jakobs uses the technique of decalcomania. 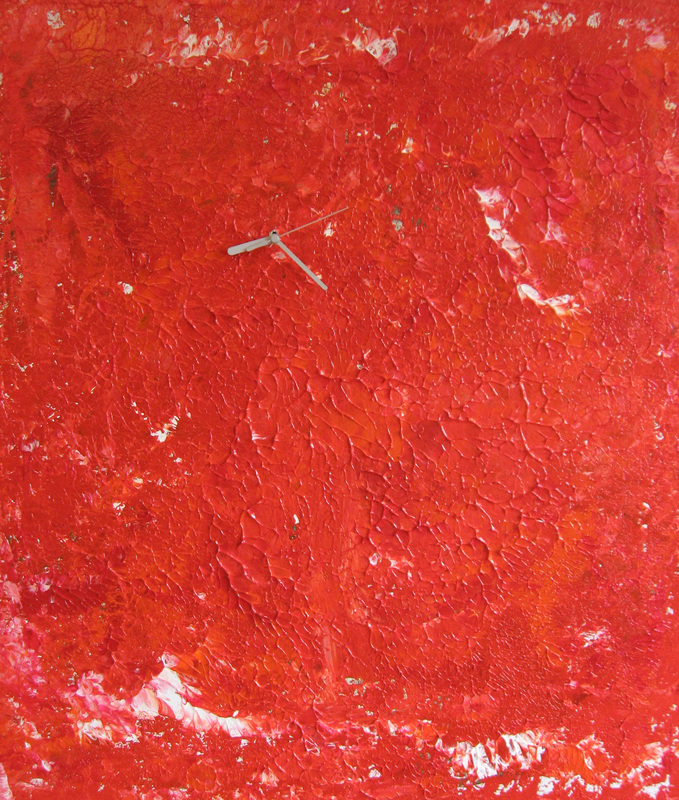 The blood red paint is applied on the canvas with a second canvas. Both are pressed together and then separated. The viscosity of the paint causes the characteristic texture of the surface. Like a cinder track, the surface seems to be marked by hundreds of tiny footprints of people hurrying at the rhythm of the clock mounted in the top of the canvas. Although apparently unobtrusive in form and shape, the clock is merciless and dominates the painting. The clock as a symbol of stress and distress. Dirk Jakobs’ painting is a modern Memento mori. The traditional elements like skulls, mirrors, and fading flowers are missing. Whereas the baroque paintings showed the declining time with the symbol of the sandglass, Dirk Jakobs transfers the antique clock to a modern watch. But the meaning stays: Lifetime is limited, time is precious, and it is running out. For all of us and for a society, in which elbows seem to be more important than legs. But they ensure the competition. We are running for the sake of running. Like hysteric hamsters we are running in circle day by day, caught in a trap of efficiency we cannot respond. Our restless legs make us blind for our environment, for our nexts. We suffer of our own egoism. Muscle ache and burnout are symptoms of a pathologic society groaning under the dictate of ultimate speed. The danger of explosion is near; it is five minutes to midnight. Dirk Jakobs pulls the emergency brake, he stops the watch hands, he makes us a gift: A break, a breathing space, since he knows: It is time for slow motion! It is time to take the time! Why do we surrend when it is so easy to break free? So easy to emancipate us from the reign of rationalised time? So easy to change the world? Once we do not longer obey, a new freedom allows seeing new horizons: We dare take the time we need, the time we long for. Time to look at a painting, to let the imagination take over mind and soul. Time to relax, to think everything over. Time to look at our neighbours, who are no longer rivals. And time to let our legs do, what they like to do: Carefully moving, clinging and cuddling in the act of love. Dirk Jakobs, born 1973, lives and works in Düsseldorf, Germany. Since 2006 he works as an artist. His abstract paintings were shown in several solo exhibitions in Germany.